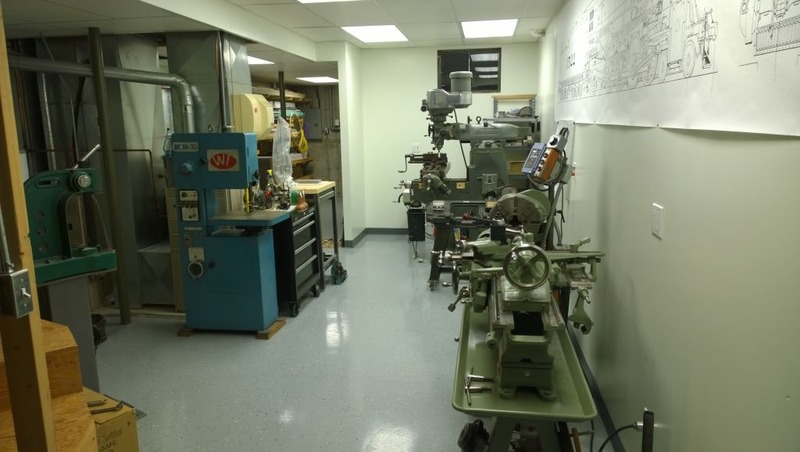 I’ve never had a formal machine shop area in my basement like my wood shop. Actually for many years my Bridgeport mill sat in my woodshop milling more wood than metal but I needed to move out and get it away from the saw dust. It then spent several years stuffed in a corner of the basement. When I started to look at this project I started to carve out an area in the basement for the metal shop. I had most of my equipment in one area but it wasn’t all that organized. 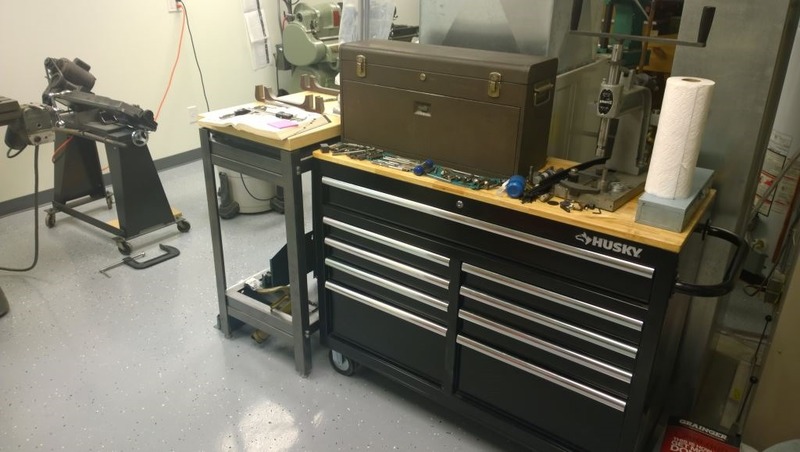 I decided I would be better off taking the time and build a proper, albeit small, machine shop now before getting waist deep into the project and then decide to do it. So the last 4 months has been spent painting the floor, running electrical, installing lighting, hanging drywall and putting in a drop ceiling. It turned into to be more work than I wanted since given that I was itching to start making chips but I’m really happy I took the time to do it. The lighting alone is wonderful and having plenty of 110 and 220 outlets makes life more pleasant. 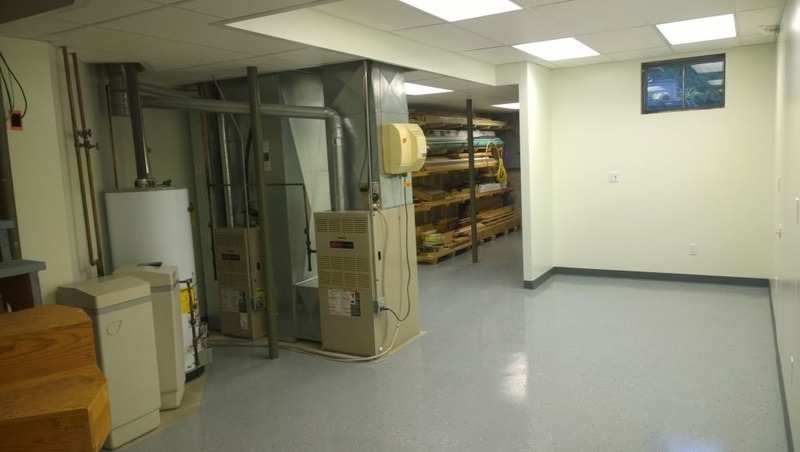 The floor was painted with Rustoleum’s garage floor paint followed with their clear coat garage floor paint. It makes for a really nice floor that is easy to sweep and makes wiping up oil a snap. We’ll see how it holds up with the metal shavings. I plan to keep the floor pretty clean but metal shavings are a little tougher on things than wood shavings. Next I moved in the machinery. I had made up a set of ‘machine skates’ from some 1/2” plate and a bunch of roller bears for wheels. They work really well moving around the equipment with easy. I rigged up a small HF bottle jack to jack the equipment up and down to get the skates under them and it has been a snap moving the 2600lb mill around the basement. With all the equipment in place I could officially start making chips. I still have a few pieces of equipment to acquire or move in; a grinder, hydraulic press and a sturdy work bench and vise but this will get me started. 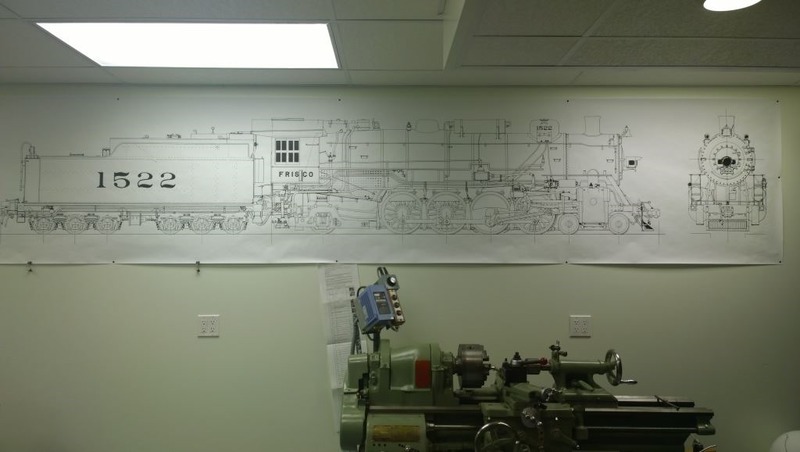 Here’s a quick run-down of the equipment. 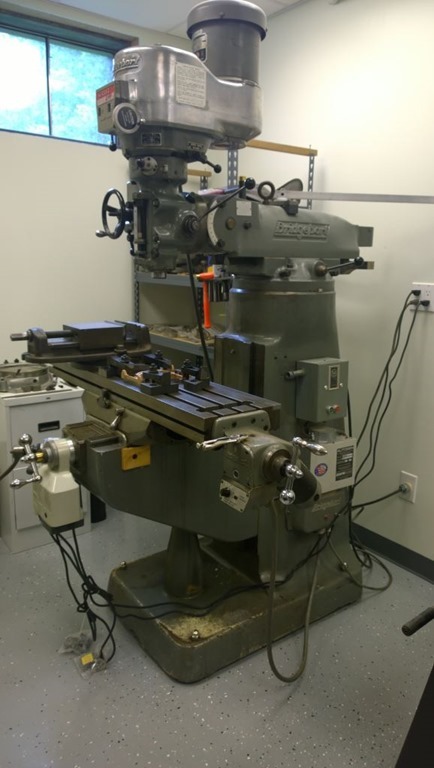 The Bridgeport series II milling machine I found on E-Bay close to ten years ago. I drove up to Detroit from St. Louis and hauled it back. I think I paid $1800 for it and I have found it to be in pretty good shape. Yeah the X axis has a little backlash in it but hopefully I soon get my DRO running on it and that will help deal a little bit with that. Reading the dials so far has not been an issue. It came with a power feed on the x axis, minus the handle which is currently being fulfilled by a set of vise grips. It actually didn’t work when I bought it but I found a replacement motor on E-Bay and swapped out the field windings and that fixed it. I have since bought power feeds for both the Y axis and knee and I’m already loving not having to crank the knee up and down by hand. It has the original 3 phase motor on it which I have been running using a static phase convertor from Grizzly without issue. 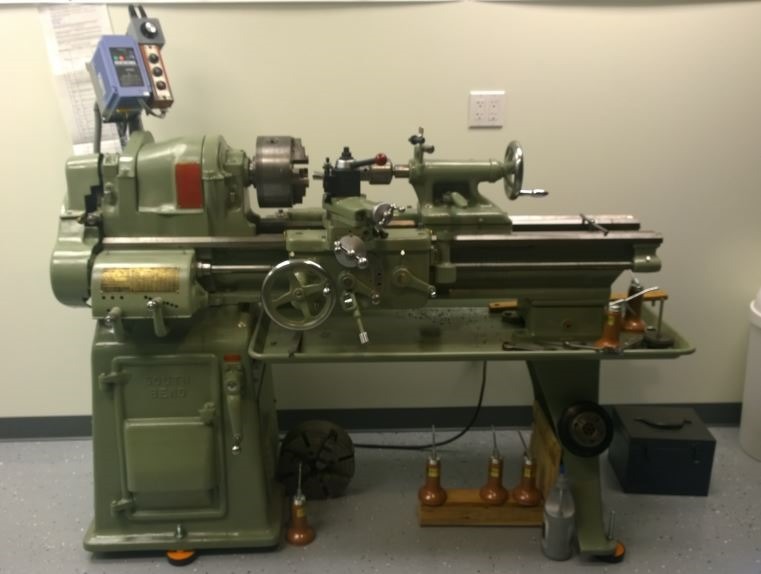 My main lathe is a 13” Southbend that I also bought off E-Bay $1500. I had to pick it up in Southbend Indiana so I too the opportunity to drive by the old abandoned Southbend Lathe Works complex which has since been demolished. The lathe definitely has some hours and wear on it. I completely tore it down, sandblasted everything and sprayed it with an industrial Sherwin Williams paint that was really nasty stuff but tough as nails. I replaced all the felts and both the cross feed and compound screws and nuts with replacements from Miller Machine and Fabrication. Brian is great to deal with and highly recommend him. He is also a live steamer enthusiast himself so he understands. I also replaced all the felts and added a Hitachi variable frequency drive to it to make speed changes a snap. I still need to adjust the bed and get it all trued up as best as possible. I have been running insert tooling it using a Phase II tool post and tooling from LatheInserts.com So far I’m pretty happy with it but I’m still a newbie so my experience is not too broad yet. 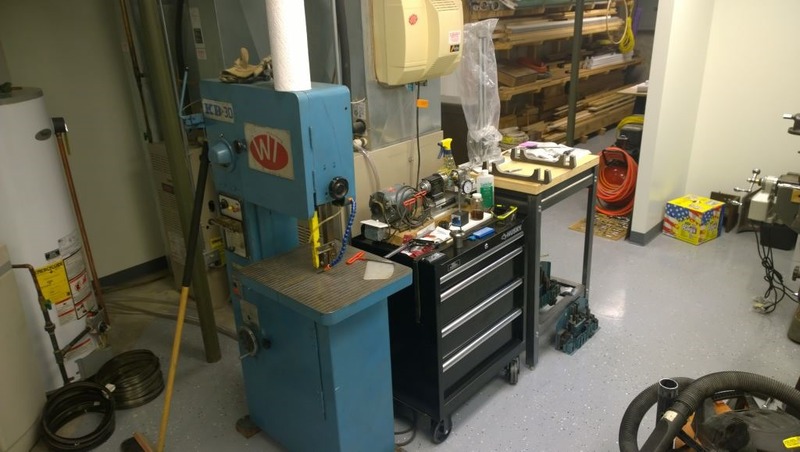 Other equipment includes the ubiquitous 4x6 horizontal band saw, a 2 ton arbor press, a small Taig lathe from my RC submarine modeling days and a recently acquired old Chinese vertical bandsaw which is variable speed. I think I’m going to really like the vertical bandsaw. It has a 12 inch throat and a pretty large table surface but it doesn’t take up a lot of space. It does include a blade welder/grinder but I may never take the time to wire it for 220V in order to use it. We’ll see. Additionally I had been on a tooling collecting/shopping spree but I think I have enough to keep me going and am now going to just wait until the need arises before getting more tooling. At least that is what I’m telling myself. And lastly I now have space to hang my ‘wall paper’. Now let the fun begin!